Exercise benefits young and old, sedentary and athletic, and whether you do it in a 24 Hour Fitness with machines and eliptical trainers, or in your backyard with stones and rusting dumbbells, the results are pretty much the same. Train hard, train often, and watch your diet. You’ll feel great and you will be healthier. Chances are you will also build some muscle and burn off a little fat while you’re at it. Unfortunately, research from the National Institutes of Health and a few other prominent organizations claim that two segments of the population, teens and seniors, are becoming less fit in general, with obesity and related diseases on the rise as a result. It is a basic outline of some simple and not-so-simple cardio, resistance and balance exercises seniors can do with little or no equipment. The article also offers some inspiration. 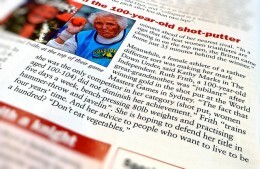 How about a 100 year old woman who can put an 8.8 lb. shot almost 14 feet? Where I live, I see an abundance of healthy teens being very active; playing soccer, skateboarding, riding their bikes and playing baseball and softball, to name a few. Very rarely do I see an overweight teen. But according to ‘the research’ there are a growing number of overweight teens every year. Considering that I loved going to the gym when I was a teenager (and doing anything active,) it is hard to imagine being sedentary as a teen. Then again, when I was growing up we had 13 channels and Atari was the reigning video game console of the day. Still, I figured there must be a reason why there are so many teenagers who are uninvolved in physical activities. Just like everyone else, the key is probably to do a wide variety of things and continue doing those you enjoy. In other words, find something you like and it isn’t ‘working out,’ it’s FUN.